Maury Regional Medical Center has invested in new robotic technology to assist with total and partial knee and hip replacement surgeries. The Mako robotic arm system has the ability to help our surgeons provide patients with a personalized surgical experience. Before surgery, your surgeon takes a CT scan of your hip or knee that is turned into a 3D virtual model. It’s loaded into the Mako System software and is used to create your personalized pre-operative plan. In the operating room, your surgeon uses Mako to assist in performing your surgery based on your personalized pre-operative plan. The surgeon guides the robotic-arm within the plan’s predefined area and the Mako System helps the surgeon stay within the planned boundaries. The Mako system allows your surgeon to make adjustments to your plan during surgery as needed. After surgery, your surgeon, nurses and physical therapists will set goals with you to get you back on the move. Your surgeon may review an x-ray of your new joint with you. 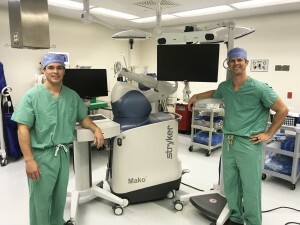 To read more about the Mako robotic surgery, click here for an article from The Daily Herald.